Holy Eucharist is a sacrament and a sacrifice. We receive the Eucharist every time we attend Mass. 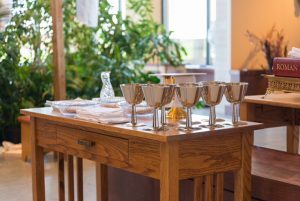 Students prepare to receive First Holy Eucharist (or First Holy Communion) usually when they are in second grade. Parents who wish to register their children for First Holy Eucharist may click here. 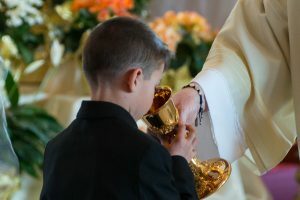 You may also click here for Frequently Asked Questions about First Communion. Christ instituted the Holy Eucharist at the Last Supper, the night before He died. When Our Lord instituted the Holy Eucharist the apostles were present.